I love violet scents because I love violet in foods. I have the most experience with violet soliflores but I’m trying to branch out and try some of the “violet heavy” perfume blends. Violet is an unique note. It’s floral, sweet, and green. Violet often gets a bad wrap since it’s often associated with old-fashioned and proper Victorian perfumes. Yep, you’ll often hear “violet” and “old lady” in the same sentence. Oh, poor violet. aroma M Geisha Violet is a more “modern” take on violet, a “boldly transposed into the 21st century…imagine sugar undercut with an edge or irony“. Geisha Violet opens up as very fruity. It smells like juicy fragrant pears and the floral-like quality of cucumber. The fruits are juicy with hints of delicate florals that are naturally present in aromas such as pear and cucumber. It is a bit tart, almost like the fragrant pear isn’t ripe yet. Geisha Violet does have an old-fashioned quality that I adore. It’s that powdery violet that one associates with older violet scents. It’s powdery, clean, and feminine. The powderiness is given to us by jovial lilacs in full bloom in the spring. The fruitiness fades and one is left with powdery, blooming purple lilac and the lily like qualities of violet. The old-fashioned powderiness mellows and I’m left with bittersweet chocolate but somewhere there’s some greenness poking through (this must be the lotus). I’m reminded of tobacco plants, freshly cut and ready to be dried. The lilac is showing more of its spicy side than the powdery side at this stage. Once again emphasizing a “tobacco” like fragrance. This bittersweet chocolate, green nicotine “accord” is unusual. But, I like it in the blend. I think the blend needed something to keep it from being another powdery floral. I can see how some could dislike this part of the fragrance. But, keep in mind. This is not a foody chocolate. It doesn’t smell like a dessert. It smells more bitter, green than sweet. This keeps Geisha Violet from being a gourmand. After many hours of wear, Geisha Violet becomes sweeter. It reminds me of candied violets, not the pre-made pastilles but actual candied violets. But, these candied violets are dusted with a little bit of cocoa powder. It’s a sugary violet with faint chocolate earthiness. 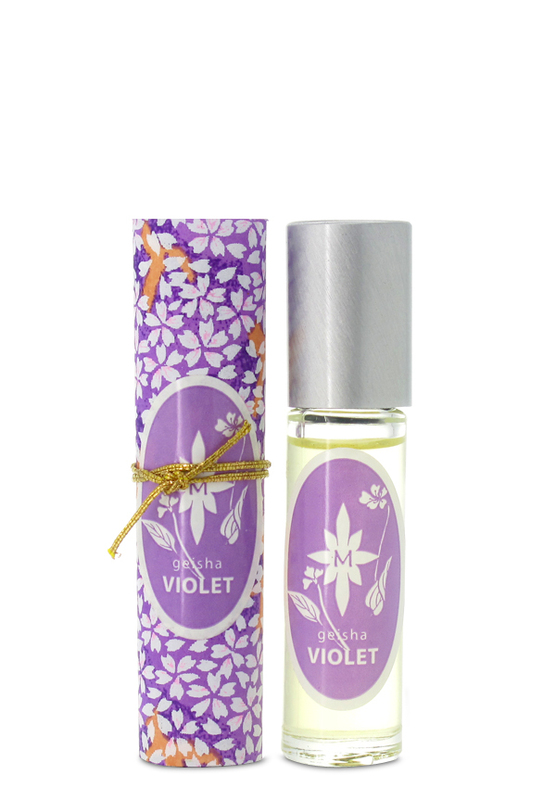 Aroma M Geisha Violet is a perfume oil. It wears like a perfume oil. This means that it lasts and it feels heavy like an oil on the pulse points. I like Geisha Violet. I find it very interesting. It’s something that I’d like to wear on a cool, but sunny spring day or something to wear in March when I’m so sick of winter but it doesn’t feel “spring” yet here. Or even today. It’s cold, 17°, snow on the ground, but it is bright and sunny. Do try Aroma M Geisha Violet before buying. I can find very few mentions of the fragrance on-line but when I do I find complaints of the chocolate. I found that my skin emphasizes the powdery and spiciness of lilac and the greenness of lotus and violet in this scent. It isn’t very chocolate-like on me. In fact, the first few times sampling this fragrance, I couldn’t pick up on the cocoa. I got more of that bitter, spicy tobacco aroma. I had to sniff hard to find the chocolate. Maybe the chocolate note is more noticeable in warmer climates? Notes listed include: violet, lilac, lotus, and chocolate. Give Aroma M Geisha a try if you are looking for an atypical lilac or violet fragrance or if you like scents such as The Different Company Sublime Balkiss EDP, Sage Amethyst Perfume Oil, and/or maybe, just maybe Vera Wang Princess EDP. An 1/4 oz. parfum roll-on retails for about $50. Aroma M Geisha Violet can be purchased at aroma m’s online boutique or Luckyscent (best for International). *Disclaimer – A sample of this fragrance was provided by aroma m. I am not financially compensated for this review or any others. My opinions are my own. This sounds interesting! I must admit, I tend to lose interest when chocolate is mentioned, but I tried Providence Perfume Co’s Cocoa Tuberose and was suprised by how much I liked the choco note. I used to be the same way. I’d scoff at anything with a chocolate note. But, not anymore. Real cocoa (not brownie or baked goods) adds so much to a fragrance. It adds a richness. I imagine that tuberose and cocoa powder smells heavenly! I’m loving choco and florals! I have been VERY curious to try Aroma M’s Geisha Rouge, the notes list is tempting. Violet doesn’t work on me, but your review is so beautifully descriptive in a way that makes me want to try it anyway! You’ve sent the lemmings to collect me again. This one isn’t a violet soliflore so it may work for you because there are other notes. The chocolate really adds depth to an otherwise spring time floral. It’s an interesting fragrance. I haven’t sniffed anything else like it. Love this stuff. It’s very cut grass on me, and then the lilac and then the bittersweet chocolate is a whisper. I notice on warmer days that I get more of that cut grass note, dewy and green, but it is still “fruity” on me like cucumber and fragrant pears. Usually those types of notes come across as “cheap” but they do not in this blend. I’m thinking that “fresh tobacco” smell is the grass mixing with the powdery florals. This sounds very original and beautiful. I actually like the smell of candied violets, so I wonder if I’ll like this? The chocolate wasn’t noticeable on me, but I did get lots of fresh greens. It’s really pretty and I like it. It is pretty. I think it is very interesting.